VATICAN CITY (CNS) — Christians should care about reading God’s messages in the Bible as much as they care about checking messages on their cellphones, Pope Francis said. As Christ did in the desert when tempted by Satan, men and women can defend themselves from temptation with the word of God if they “read it often, meditate on it and assimilate it” into their lives, he said before praying the Angelus with those gathered in St. Peter’s Square March 5. “What would happen if we turned back when we forget it, if we opened it more times a day, if we read the messages of God contained in the Bible the way we read messages on our cellphones?” the pope asked the crowd. The pope’s reflection centered on the day’s Gospel reading (Mt. 4:1-11) in which Jesus is tempted by the devil while fasting in the desert for 40 days and nights before beginning his ministry. “Through this triple temptation, Satan wants to divert Jesus from the path of obedience and humiliation — because he knows that through that path evil will be defeated — and take him on the false shortcut of success and glory,” the pope said. “The Bible contains the word of God, which is always relevant and effective. Someone once said: What would happen if we treated the Bible like we treated our cellphones? What would happen if we always brought it with us, or at least a small pocket-sized Gospel?” he asked. While the comparison between the Bible and a cellphone is “paradoxical,” he added, it is something that all Christians are called to reflect on during the Lenten season. “If we have the Word of God always in our hearts, no temptation could separate us from God and no obstacle would deviate us from the path of good,” the pope said. 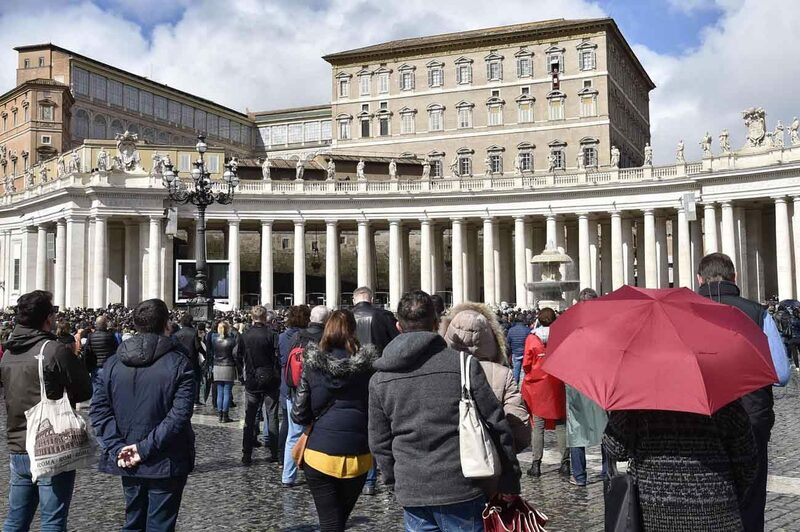 After praying the Angelus prayer with the faithful in the square, Pope Francis asked for prayers before departing for a weeklong Lenten retreat with members of the Roman Curia. Lent, he said, “is the path of the people of God toward Easter, a path of conversion, of fighting evil with the weapons of prayer, fasting and works of charity,” Pope Francis said. “I wish everyone a fruitful Lenten journey,” he said.